Threadless Internal Cups, Sealed Bearing, Straight 1-1/8"
To run the forums, host the website, and travel, I charge a universal service fee for my reviews. This review was sponsored by Gazelle North America. My goal is to be transparent and unbiased, this video and written review are not meant to be an endorsement of Gazelle products. Driving the CityZen T9 HMB is a Bosch Performance Line center drive geared motor. The black plastic casing blends in a bit nicer on the Speed T10 model, because it matches the black frame, but it’s terrible here. The plastic chain protector completely covers the proprietary 15 tooth chainring, keeping your clothing from getting messy. 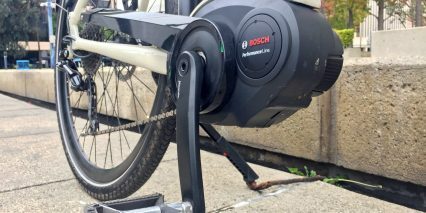 As mentioned and demonstrated in the video review above, this motor produces a bit more noise when operating at high power, and when you pedal quickly. 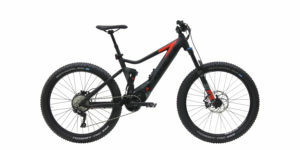 It can produce up to 63 newton meters of torque, making it a very capable climber if you shift into lower gears. A 9 speed Shimano Deore drivetrain gives you many options, and the motor controller offers shift detection to reduce clunking and wear. 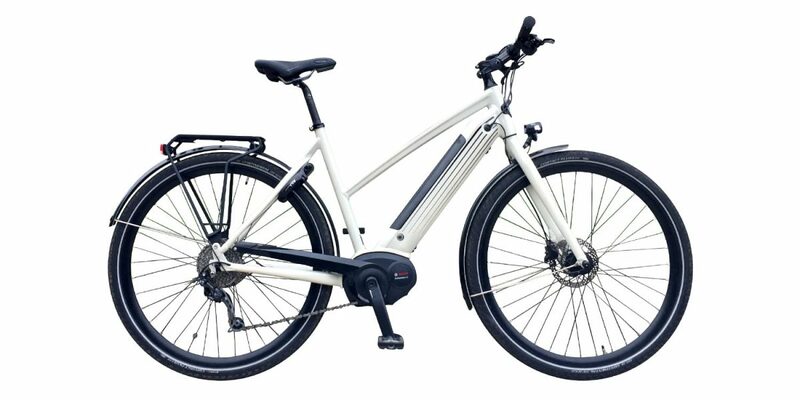 This is one area where Bosch really leads the market. 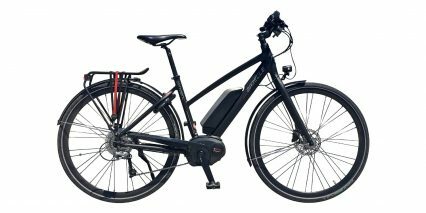 The Performance Line motors can also support higher pedal cadence, up to 120 RPM, so you can downshift going into a climb without losing power. One mixed consideration is that the smaller chainring operates through a reduction gear that spins at 2.5x the pedal rate, making it equivalent to a 38 tooth chainring on a traditional setup. 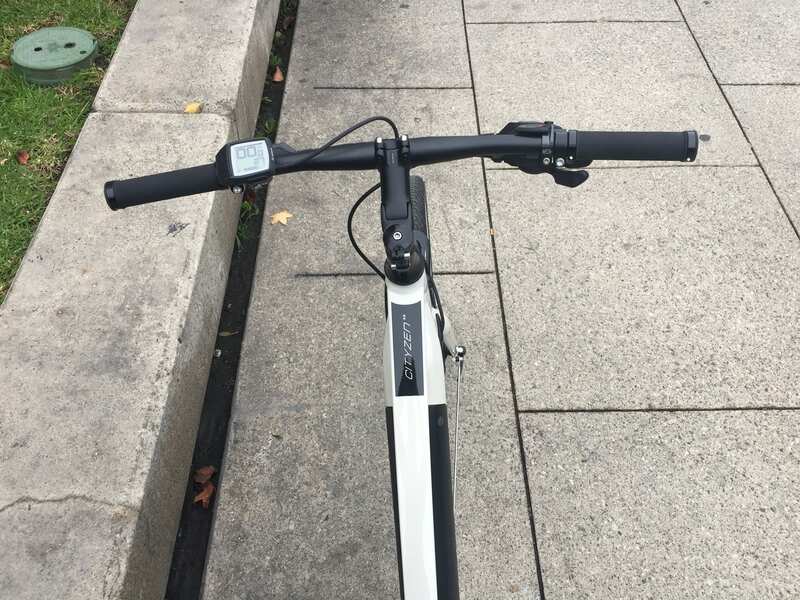 This reduction process introduces some friction drag if you pedal the bike unpowered or beyond the maximum supported 20mph here. 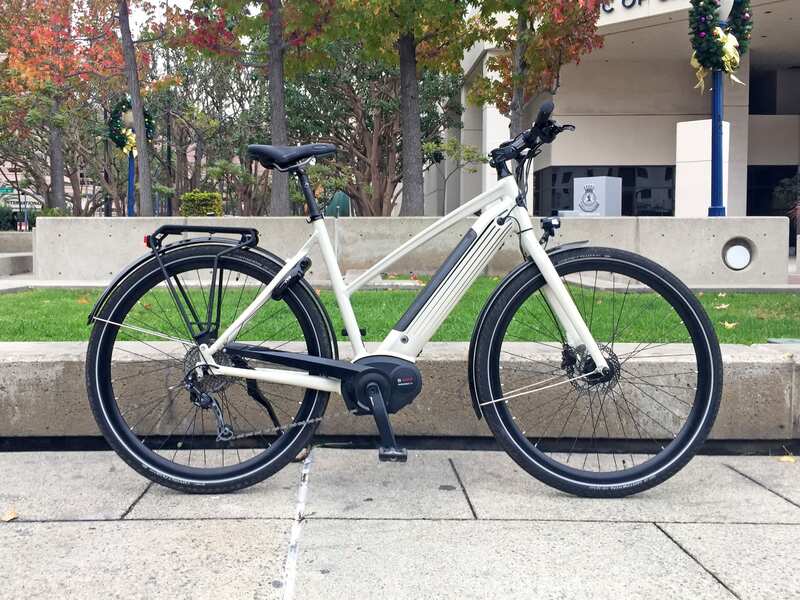 In the video review, I pedaled up to 22mph on flat terrain, demonstrating how efficient the rigid frame, hybrid tires, and drivetrain are, so I consider the reduction gearing thing a minor trade-off. And, I’m told by Bosch that it allows for better chain retention. 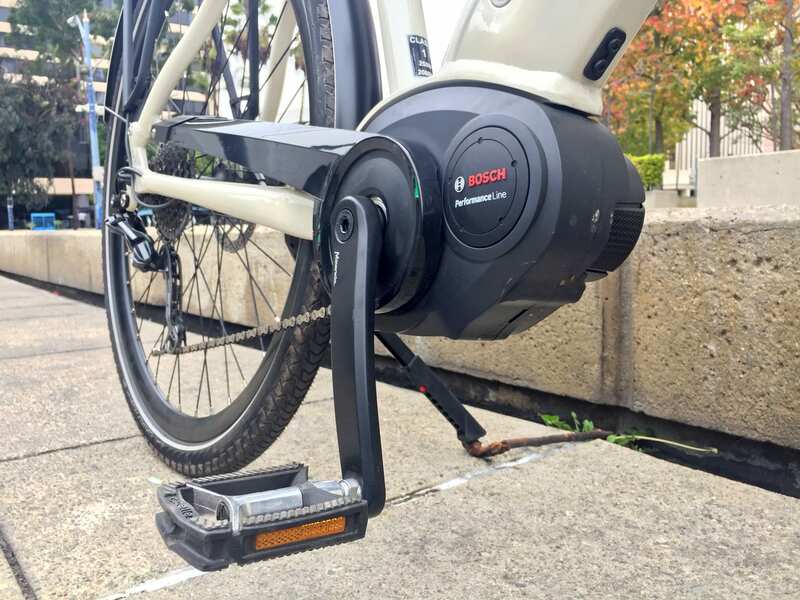 Bosch ebike motors are designed to measure rear wheel speed, pedal cadence, and pedal torque signals over 1,000 times per second, making them extremely responsive. 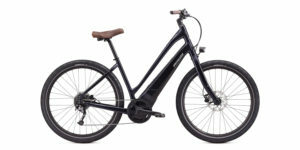 The motor can feel natural, or zippy and empowering depending on which level of assist you choose to ride in. 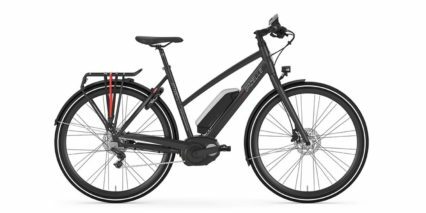 Powering this ebike is the highest-capacity Bosch battery on offer this generation, and it’s also their fanciest. 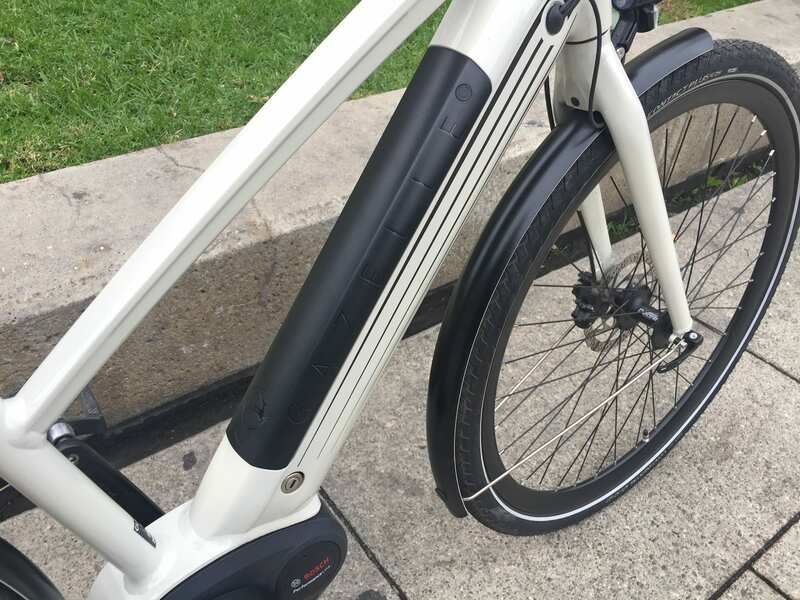 The PowerTube 500 fits neatly inside the downtube of the CityZen T9 HMB, completely out of view… aside from the black plastic cover. This again, is one area where the all-black CityZen Speed T10 wins out aesthetically. 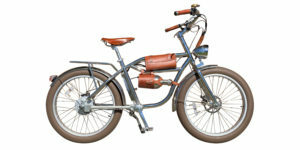 The PowerTube battery keeps weight as low as possible on the frame while still being removable and somewhat universal. 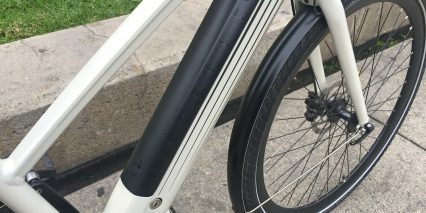 I’m actually sort of mixed on the PowerTube batteries because they weigh almost a full pound more than the older PowerPack batteries (which mounted externally on top of the downtube) and are not as easy to swap between bikes because each company has designed a different cover system. 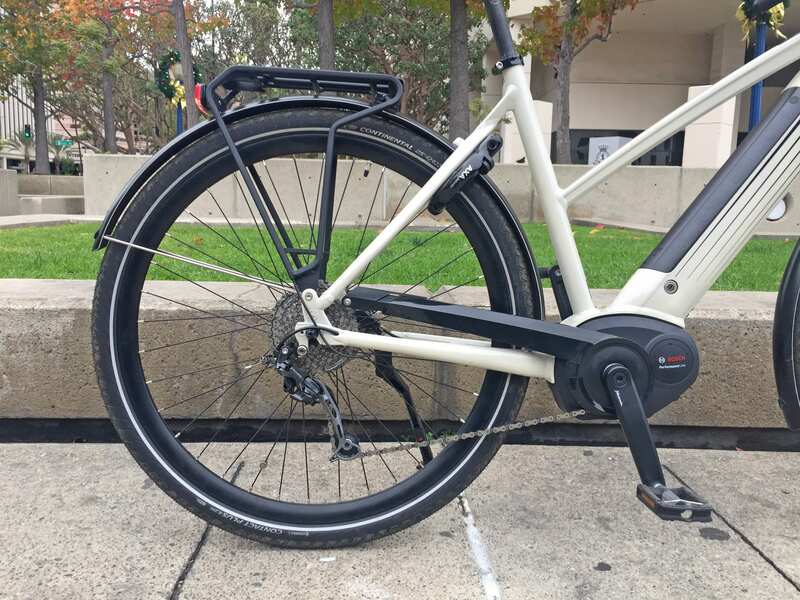 In this case, the battery seats down front the top, which means that you’ll have to balance it between the top tube and downtube before easing it in. 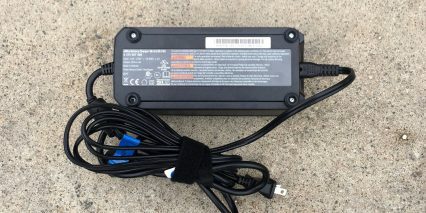 There’s definitely potential to bump and scratch the top tube or the cover of the battery pack here… but it’s a much better system than some bottom-up integrations I’ve seen from competing companies. There’s enough room between the downtube and top tube to position the pack for removal and reinstallation, but only just. 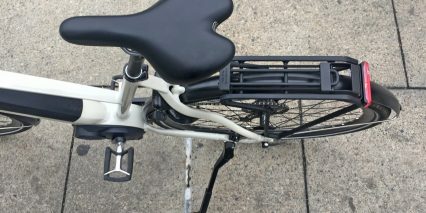 And, I’m surprised that Gazelle didn’t provide bottle cage bosses on the top tube or seat tube because they can be useful for all sorts of accessories aftermarket, and provide more strength and reliability than rubberized clamps and such. At the end of the day, this battery is reliable, can be charged on or off the frame, and the frame charging port is positioned high up on the left side of the downtube where it won’t interfere with the crank arms or require you to bend down as far. Big win! 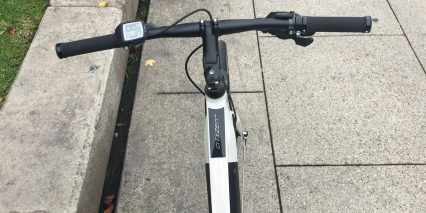 I also love the kickstand position and hardware choice on the CityZen models. 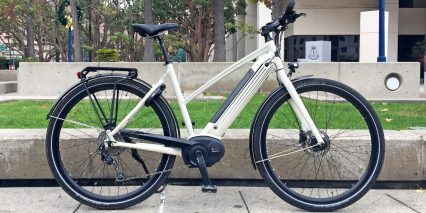 It may sound like a little thing, but I frequently see e-bikes with mid-mounted kickstands that interfere with the left crank arm. 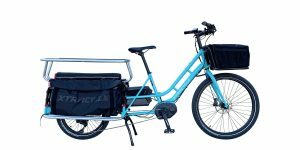 This stand is positioned directly below the rear rack (great if you’ve loaded it with heavier cargo), and can be adjusted without tools. 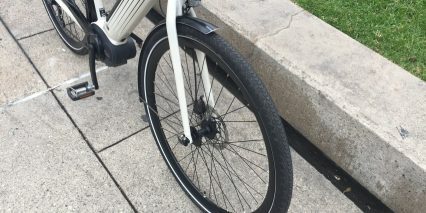 That means you can securely stand the bike on flat or angled surfaces pretty much on the fly. 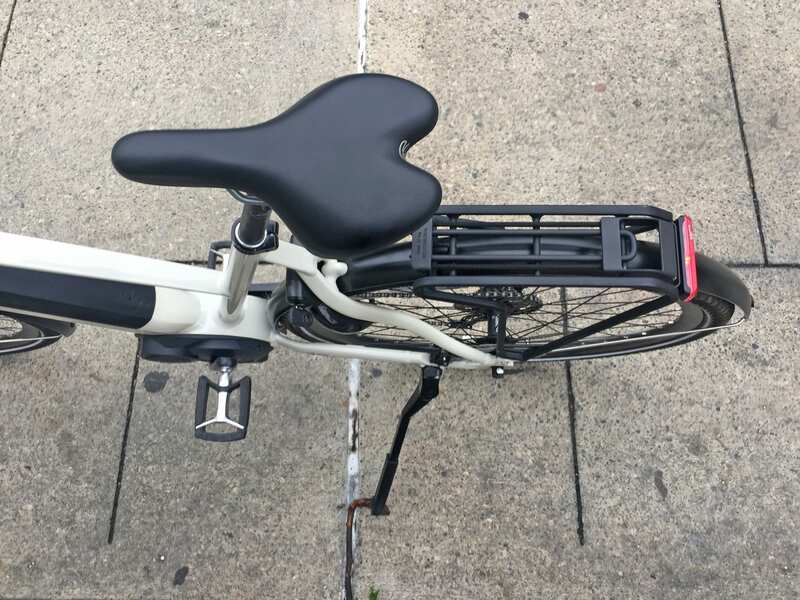 I also want to call out that the rear rack is rated to handle more weight than other generic racks (rated to 27kg vs. 25kg). 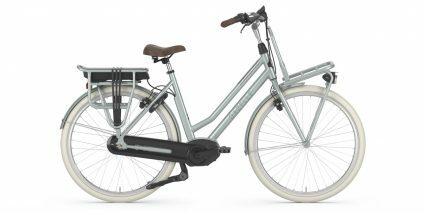 It comes with a triple-bungee strap system and connects to the rear fender to add strength and reduce noise. 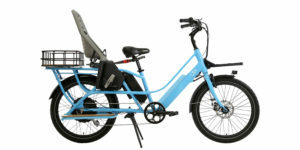 It’s great if you’re bringing an extra battery, the fast 4 amp charger, or a child seat and young passenger. 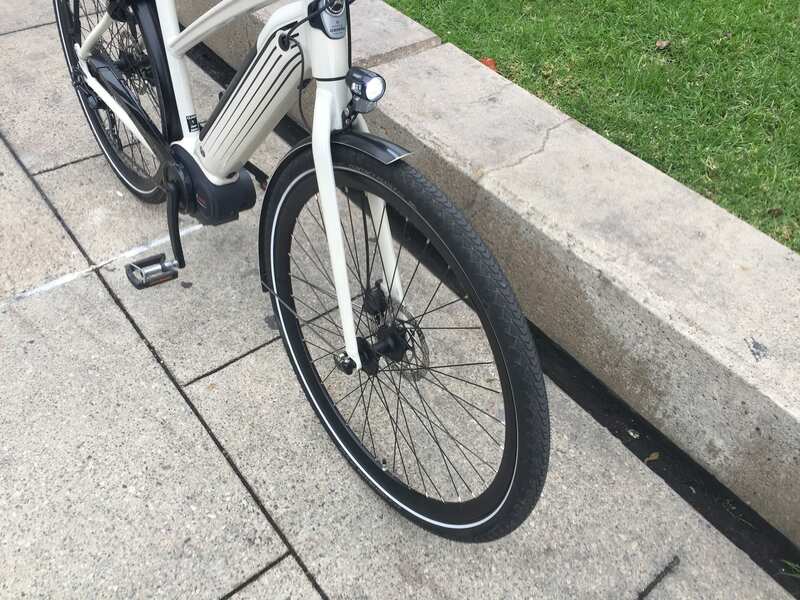 Back to the battery pack, I was impressed that the AXA locking core uses the same key as the frame lock (designed to put a rod through the rear spokes for temporary parking security). 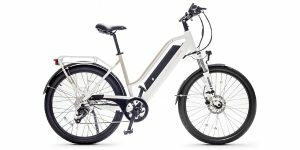 This is the type of little upgrade that only the fancier ebikes seem to offer, but it isn’t done perfectly here in my opinion. The key remains locked into the cafe lock until it is securing the bike, and that creates some question about keychains dangling vs. losing the key easily or having it stolen off of your bike… I wish AXA/Gazelle had chosen a design that let you take the key out in the locked or unlocked position. This is the case for the hardware I saw and tested on the Moustache Samedi 28.3 Open. Interestingly, that cafe lock is also made by AXA? 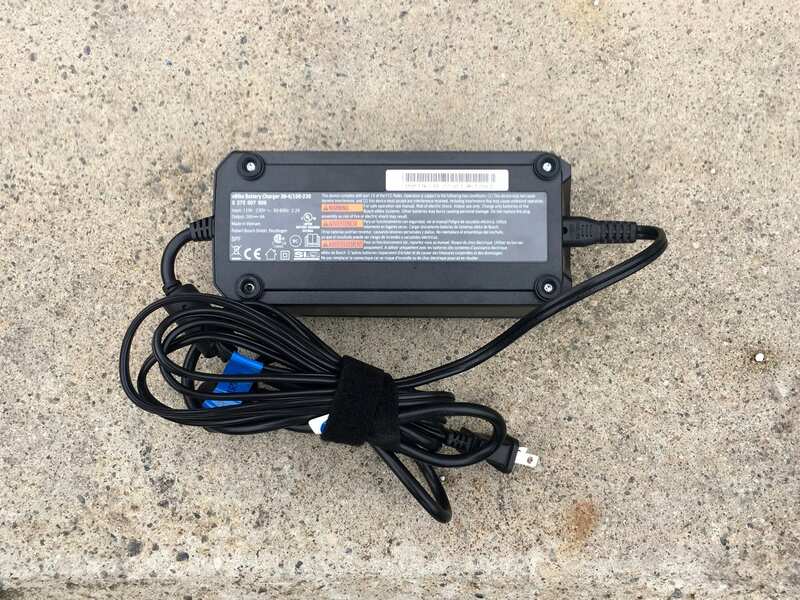 One final note on the battery, and really any lithium-ion pack, is that extreme temperatures can be harmful to the cell chemistry and allowing it to drop below 20% can decrease the overall lifespan. For this reason, it’s great that the pack is removable, so you can bring it into your office or home for safe keeping and convenient refills. 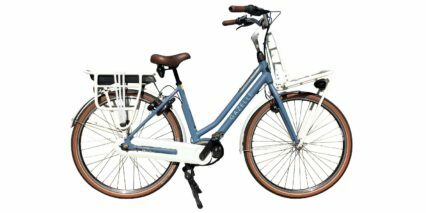 Weighing at at roughly 53.5lbs for the medium sized frame, I’d consider this to be lightweight and extremely well balanced. 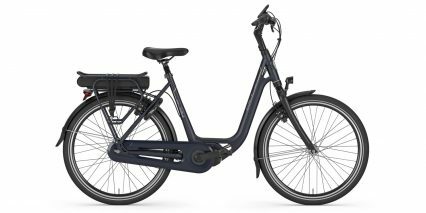 All of the accessories chosen by Gazelle are top notch, meaning that they don’t rattle around or feel flimsy, and should be durable over time. Even though the motor produces a bit of extra noise and some reduction gearing drag, it’s one of my favorites because of its reliability and responsiveness. I think Gazelle did an excellent job with their PowerTube battery implementation, and aside from some confusion for me around why the cafe lock requires locking before the key can be removed… I’d call this a very well thought out electric bicycle. 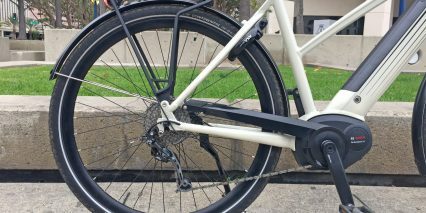 They hydraulic disc brakes are responsive, fairly powerful, but small enough to avoid bending damage at bike racks. 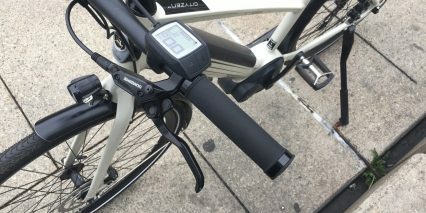 You can adjust the brake levers in or out to fit your hand size. 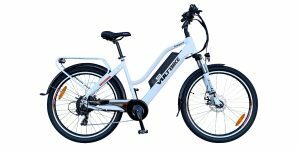 The nine-speed Shimano Deore drivetrain is lightweight, proven, and offers a good range of pedal cadence options. 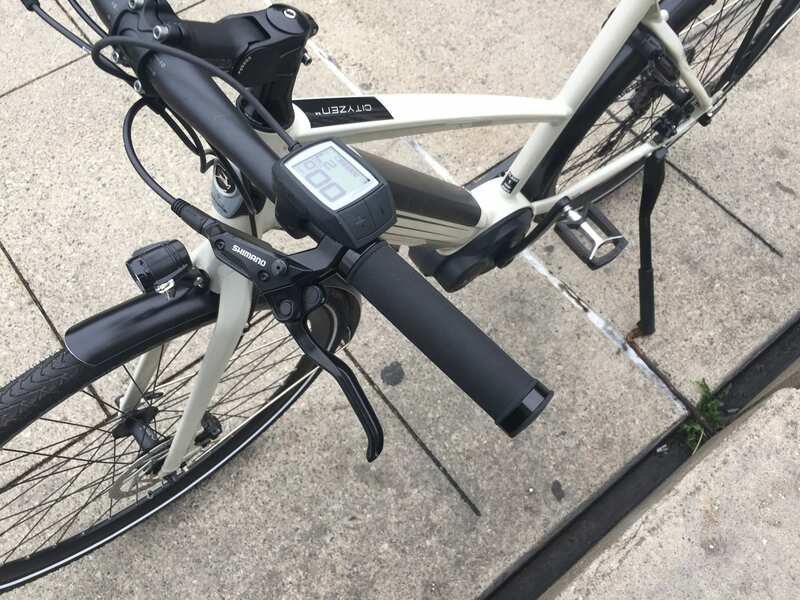 I complained about the T10 not being specced with Shadow Plus (a little clutch mechanism to reduce chain bounce) but that’s less of an issue at 20mph vs. 28mph. Expect to get better range on this model vs. the Speed, but expect the same high level of service and fitting. For me, it’s nice having faster 120 RPM pedal support and shift detection at hand… and even though the Purion isn’t my favorite display from Bosch, it’s still a leading option industry wide, and some shops will upgrade to Intuvia for $200 if it’s really important to you. Gazelle offers an excellent two-year comprehensive warranty and has an outstanding global reputation for the longevity of paint. They UV test their products and expose them to salt water tests to simulate coastal and rainy environments. The company is over 100 years old, receiving a Royal Dutch honor for being a leader in the country. As always, I welcome your feedback and comments below. 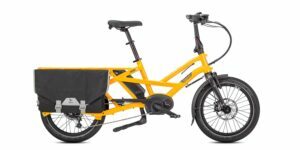 I do my best to be thorough and thoughtful with these reviews and it was nice to get help from Chris Nolte, owner of Propel Bikes in Long Beach to chime in with some feedback on why he carries the brand for the video. Feel free to post your own thoughts and pictures in the Gazelle ebike forums, and ride safe.